Do you Need Filing Cabinets? While it is becoming increasingly popular to find only electronic files in offices, there are many businesses that still prefer to use paper filing systems. A paper filing system allows you to access your files quickly and physically without the worry of a computer malfunction. Electronic files also run the risk of being tampered with, deleted, or mislabeled, which could make it difficult to find the file. Instead of worrying about the hassle of electric filing, many offices are still trusting paper files to stay organized. In order to have a successful filing system, you will need filing cabinets. There are three different kinds of filing cabinets that your office could implement in order to have a successful and simple filing system. The Archive Files- This filing cabinet should be stored towards the back of the office because it contains older files. These files are not used on a regular basis and are only being kept for record purposes. The Current Files- This filing cabinet should be kept out where you regularly work because it contains files that are used often. Choose a cabinet that can be included in your immediate work space to help increase productivity. 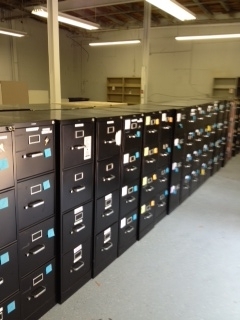 You can also include your personal files within these filing cabinets. The Active Files– These files should be kept in a more communal area for the use of everyone. Choose a cabinet that can fit comfortably within your conference room or behind a front desk. Files are great to use for the office because they help make retrieval, staging, storing, work materials, supplies, and equipment more efficient. Reliable file cabinets will help your work environment inevitably improve in productivity. This entry was posted on Friday, March 13th, 2015 at 11:34 pm. Both comments and pings are currently closed.